Does this sound familiar to any readers? Cue awkward silence as both parties ponder exactly what this means for the department and the subsequent results. I think we have all had a similar conversation with at least one pupil each year or avoided such a conversation as we know what the outcome will be. Jonny might well be a nice lad; enthusiastic and generally hard working but the fact is he just doesn’t have any design ability and has two left hands when it comes to making project work. His parents would like him to follow a practical route just as they have but it’s not the right route for him…what to do. Then there are the students who really struggle academically and, by default, have been put into as many subjects as possible that have Non Examination Assessment (NEA) elements. The hope is that they will at least achieve some success in that element of the course but what about the other 40%...soon to be 50%? Often they may have little or no interest in design and technology but there is this belief that they will somehow do better in the subject than in history, geography etc. This annoys me greatly I have to say. I firmly believe that D&T is a subject that rewards students who work hard, that they deserve what they get (in a positive sense) and what they get out of it is commensurate with what they put in. If you have a student who, from day one, has little interest in the subject then it is almost a certainty that they will put the minimum effort (if any at all) into the project work and the theoretical study required to pass the (soon to be 50%) written examination unless you are opting for the technical awards. We have all experienced the struggle of 'pulling teeth' with students who simply shouldn't be in our subject for one reason or another. It is the double edged sword that is an attractive department doing 'more interesting' stuff than maths or history and the surprising amount of theoretical knowledge and design skills needed to succeed in the subject. I would liken it to surfing or skateboarding; it looks really cool and those who are good at it make it look effortless which encourages you to buy one and have a go only to fall over a lot and write it off as a mistake. 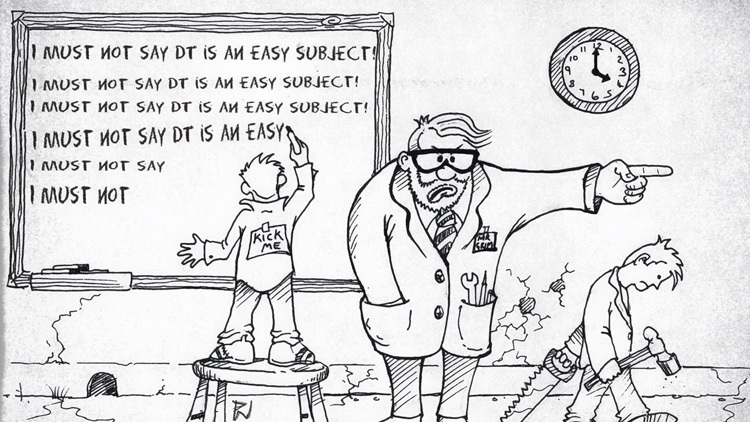 These are problems most D&T teachers are more than familiar with and, for some, is the reason they struggle to achieve successful results each year; not their teaching, planning, delivery or assessment but the raw materials they have to work with metaphorically speaking. The subject, to an outsider can often seem like a bit of a 'jolly' time making stuff, playing with power tools and generally being all creative with less written work and exams but they soon find out that it's not really like that at all and its often too late for them to move elsewhere so you have the pleasure of their disgruntled company for a few years. I make it sound like kids are flocking to D&T whether misguided or not but sadly, the flip side of this is that some departments are struggling to remain feasible to run as they have dwindling numbers. The real kick in the teeth is that they have to accept Johnny and his ilk in order to be able to run D&T courses at all; a quick browse through social media forums will show just how many are struggling or are having to adopt the less academically rigorous technical awards in order to keep sufficient numbers to run design courses at all. Of course, this is not an ideal situation at all but many of you may be faced with the choice between not running a course due to low numbers (presuming you can even attract enough talented students) or accepting lower ability students and running a technical award. In an ideal world; one where educational leaders saw just how vital this subject is to the future of the economy, trade and modern life in general, we would be fighting students off and it would be those with the most to offer as well. Sadly, that's not the current educational world we live, particularly in the UK so teachers are having to make such choices each year or simply welcome another cohort with welcome arms in the knowledge that some students of varying ability is better than no students, and possibly no department, at all! !